Which came first? The jewelry or the outfit? This is a question I am often asked and the answer isn’t always the same. As my polymer designs have evolved over the past few years, color and shape have become more important and inspiring. Of course, inspiration is everywhere, but for me as a costume designer, textiles have always been a huge source of inspiration. 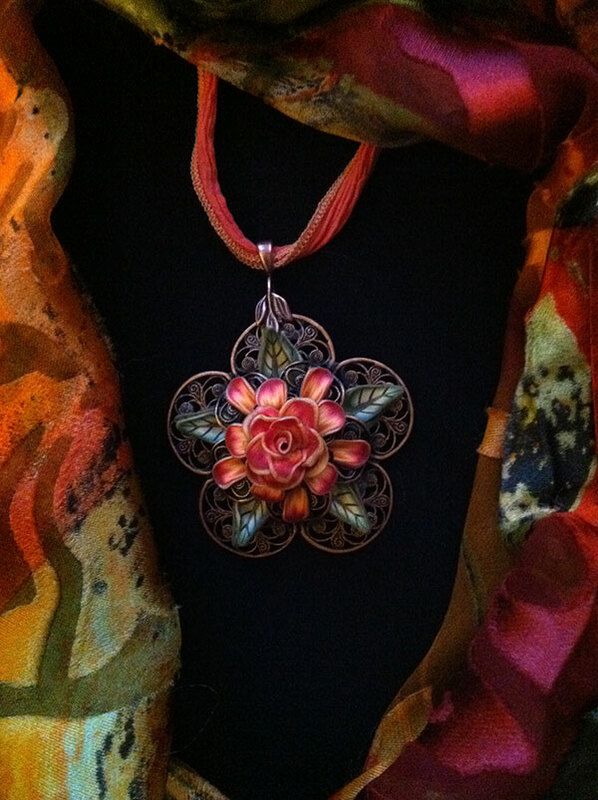 After falling in love with this beautiful silk jacket, I rushed to my studio to combine just the right colors in this fire rose pendant. Sometimes the outfit comes after the jewelry, but either way, creating a complete ensemble is always a joy! I am now wholesaling most of these designs in galleries across the US, you can see more colors and designs at www.wholesalecrafts.com/visitor. Artist #23846, guest password- jpclay. Or at my regular site, www.twocanclaydesigns.com. For the majority of my personal pieces it is always the outfit that gives me the inspiration I need to create my jewelley from the colour of a dress, a top & even the print from a pair of shoes. I love that necklace Janet! Isn’t that one of the great things about PC, that we can design something on a whim to match and outfit. Good luck with your wholesaling! I am a little of both, too. Sometimes I will look at a clothing piece or length of fabric and immediately start planning the accessories. I have started getting back into sewing which went by the wayside when clay got in the way. I recently sold off about 3 of my 8 crates of fabric and in the process discovered some old friends that have reinspired me! That is really beautiful. I too sometimes find clothing that I have no jewelry fo,r so go home and make it. I had a lot of practice when I used to make jewelry for a specialty childrens shop. They would let me bring the dresses home so I could make the jewelry to match!